Bo Young's treat yesterday because she got her pay from her work. We went to Shi Ge again because Bo Young hasn't try it before. 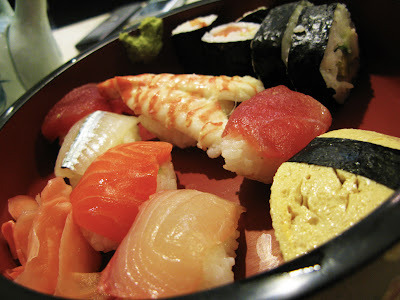 We had a small sushi mix and Butter Scallop to share. 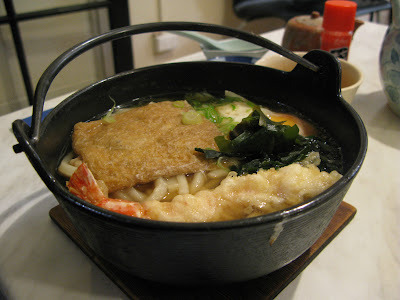 Joe had the Nabe Udon for himself. Bo Young and I shared Shabu Shabu. We were not really satisfied with what we have ordered because it was tasteless. We were not sure if Shabu Shabu meant to be tasteless (it taste like boiled water with onions) or the chef forget to put in flavouring. But we tried our best to finish it anyway cuz I was in a hurry. 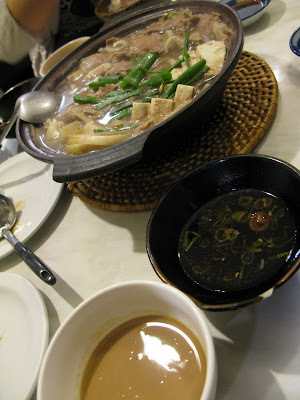 When Bo Young was paying for the meal, I decided to ask the waitress (low tone) if Shabu Shabu meant to be tasteless. She told me she never try it before so she went to ask her chef. After the chef heard from her, he stomp out, looked at me and said "SHABU SHABU IS TASTELESS! YOU DON'T KNOW HOW TO EAT! IF YOU WANT TASTE, U SHOULD TAKE SUKI YAKI! THAT'S WHY I GIVE YOU SAUCE!" I WILL NEVER FUGGIN EAT SHABU SHABU AGAIN! well, let's say he speak LOUDLY to me until the whole restaurant oso looking. After that night, I know shabu shabu taste like water + onion. more water taste.